Indians can buy warm clothing and water proof trekking shoes at Decathlon stores in most major cities. Will we have sufficient time and training to acclimatize for the journey? Lhasa groups (A and S) will be staying in Lhasa for two nights to acclimatize. For the Heli group, we will spend two nights in Purang to acclimatize. In case of emergencies, what are the steps that will be taken? A qualified and well-equipped doctor especially trained to handle high-altitude sickness and other conditions that may arise, will accompany the group throughout the program. If an evacuation becomes necessary, you will be taken either to a lower altitude or the nearest medical facility. By undergoing all the medical tests mentioned in the medical form and consulting your physician about your fitness to travel to a high altitude of 18,000 feet and above. I have been to high altitudes last year and my stay was uneventful. Do I need a medical exam? Yes, it is necessary to undergo a medical examination every time before going to a high altitude region. Yes, a medical assessment is mandatory. You are required to travel through high altitude region. In such places, the atmospheric air is under low pressure and people may suffer from hypoxia (less oxygen). In the rarefied atmospheric conditions, a person may develop ailments like pulmonary edema/cerebral edema and acute mountain sickness. Participants must therefore be screened thoroughly before they are taken to high altitudes. What is the accommodation provided and can I book a single room? Best available hotels / guest houses in the rest of Tibet. Facilities in Tibet are very limited and therefore the quality of accommodation will vary from one place to another. Rest assured, we will be providing the best of what the place has to offer. As a policy, everyone must share their room as symptoms of high altitude can arise unexpectedly. Therefore, it is a safety measure to have another person in the room in case you require help. How can I stay in contact with my family during the travel? Wi-Fi is available at most hotels until Saga. There is no connectivity while at Manasarovar and Kailash, so please inform your family in advance. The program coordinator will be equipped with a local China phone at these places for emergency communication. It is recommended that you stay focussed on the pilgrimage and keep contact with the outside to the minimum in order to make the best use of these sacred spaces. How many hours of travel is involved every day in the Lhasa group? About 6 to 9 hours per day. Will there be any major expenditure that I am likely to Incur? Expenses in case of evacuation due to medical emergencies, natural calamities such as earthquake, landslide, floods or change of government rules etc towards travel, boarding, lodging and medical costs. To facilitate the group visa, your original Indian passport is required at New Delhi. The dates will be notified to you at the time of registration. How do I get my visa for Nepal and Tibet? The age limit for travel to Kailash is fixed by the Tibetan foreign affairs department and can vary each year. Those above the age of 65 years may be required to undergo additional medical tests to determine their physical fitness. 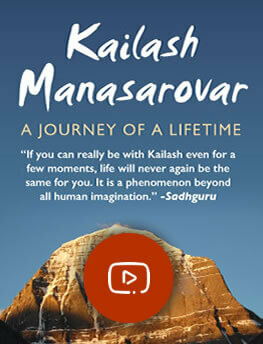 What is the eligibility criteria / prerequisite to be a part of the Kailash Manasarovar sojourn? The Inner Engineering Program with Shambhavi Mahamudra and / or Shoonya Initiation is a prerequisite for participating in Isha Sacred Walks Sojourns. These simple but powerful energy processes for inner transformation will greatly enhance your experience of the vibrant places that you will be visiting and will also prepare you both mentally and physically for the sojourn. What are the documents required for this sojourn?